Narrow when young, becoming oval with age, this tree has a very symmetrical and formal appearance. The dark green foliage turns yellow in the fall. The trunk has smooth gray bark, which can develop a muscle-like fluting with age. It is disease and pest resistant, and tolerant of difficult conditions. 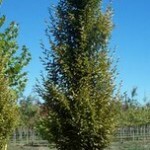 Frequently used as a street tree, it can also be used as a hedge, as it responds well to hard pruning.